Power Rangers shares its similarities with its TV counterpart in terms of character, zords, style, and tone. But there are a few key differences. In the film, Rita (Elizabeth Banks) and Zordon (Byran Cranston) have been battling each other, which seems to have started 65 million years ago. Though the fight ended in a stalemate, they would be fossilized until they could be awakened where their fight would start all over again. Flash forward to today where we find out Jason Scott (Darce Montgomery), Kimberly Hart (Naomi Scott), and Billy Cranston (RJ Cyler) are all being punished for causing trouble on campus. Jason for pulling off a prank, and not ratting out his friends; Kimberly for breaking a fellow student’s nose; and Billy for blowing up his locker by accident. Billy quickly befriends Jason after he defends him from a bully. To show his gratitude, Billy helps Jason bypass his ankle bracelet so that the two can go to a mining site to help him find possible fossils. While Billy sets the charges, Jason finds Kimberly hiding away, and the two bond over the idea of running away. But when the explosives go off successfully, it draws the attention of Trini (Becky G) and Zach (Ludi Lin) who are escaping from the reality of home for their own reasons. All five come together and collect five coins, one for each. Without realizing it, they awaken the next morning with superhuman strength and durability, and all of them decide to go back to the site to investigate their newfound powers. That’s where they find the ship that holds Zordon’s spirit. With the help of Alpha 5 (voice of Bill Hader), they train to harness the power to morph into the Power Rangers. All the while Rita has awakened, and is collecting enough gold to resurrect the monstrous Goldar, who will excavate the Zeo crystal, which has the power to destroy Earth if in the wrong hands. As you might have guessed, the film doesn’t move as episodically as its TV counterpart. Where we have many episodes to get to know these characters, we are only given minutes to do so in this new film. Still, that doesn’t take away from the fact that we already know who they are. It is just that Jason, Billy, Kimberly, Zach, and Trini all have new struggles they are dealing with. These struggles are a reflection of what kids go through today. All of them feel like an outsider, and all for different reasons. John Gatin‘s script has characters that some of the audience can relate to. Though the cast doesn’t know each other before the film, their friendship and bond really come through. The chemistry that they have is earned as you can see them bond together through their merits and their faults. Some come to terms with who they are and accept the fact that it is okay to be different. Banks really sells the cheesiness of Rita, but also adds a few things that make her truly terrifying. Of course, it’s hard not to look away from the combination of beauty and fear when Rita looks like that. Though it was a nice nod to have Cranston return, it often felt like he was just reading off the page. Hader provided the comic relief. But the film is more about the new heroes. There are some shreds of campiness that reverberate throughout the film. It is, after all, based on a campy TV show. But this is big-budget campy. The effects are larger. The Power Ranger suits are high quality and more sophisticated. They’ve got some major supporting star power from Banks, Cranston, and Hader. It all comes together very nicely. You don’t even have to be a fan of the show to see that Power Rangers is a lot of fun. 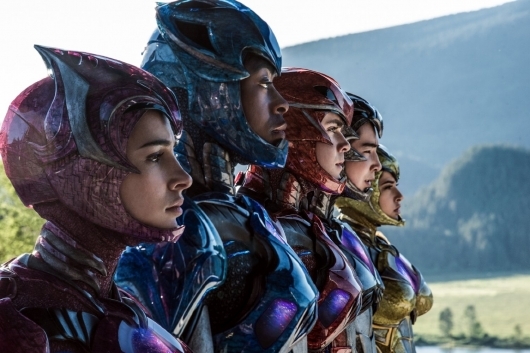 Though it seems pretty clear that the loyal fanbase will cheer when Rita says her signature phrase “Make my monster grow,” or when the fan-favorite Mighty Morphin’ Power Rangers’ theme song plays as the Zords come charging to save the day. Perhaps the biggest concern for this newly rebooted franchise is that the film has exhausted a lot of its story right from the get go. Now if successful, the sequel will follow a similar path that will introduce new characters, including one that will that is a clear fan-favorite character. Those who know the franchise well can probably guess where it is heading. There really is no mystery to it. But you have to believe that Israelite and Gatins have an idea that would make the sequel standout. There is no doubt that Power Rangers is just non-stop fun. We have familiar but new characters that have more depth to them than their TV counterparts. Though it can be cheesy at times, the film manages to maintain a sense of sincerity. Yes, the stakes are out of this world, but these characters are going through real-world struggles, making it that much more easier to sympathize with them. If anything, Power Rangers is more about them coming together as one and realizing that it is okay to be yourself.